Mushroom Au Gratin Potatoes - AMAZING side dish!!! Mushrooms, potatoes and a homemade Gruyere cheese sauce. Comes together in minutes! Great for a dinner party or potluck. A real crowd pleaser!! 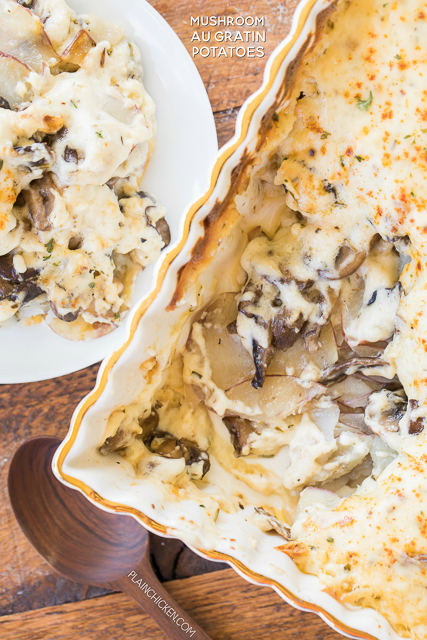 These Mushroom Au Gratin Potatoes combine two of our favorite steakhouse side dishes - mushrooms and cheesy au gratin potatoes. We always get an order of Au Gratin potatoes and a side of mushrooms when we go to fancy steakhouses on our trips. I decided to combine the two into one dish. The result was one AMAZING side dish! OMG! SO delicious. 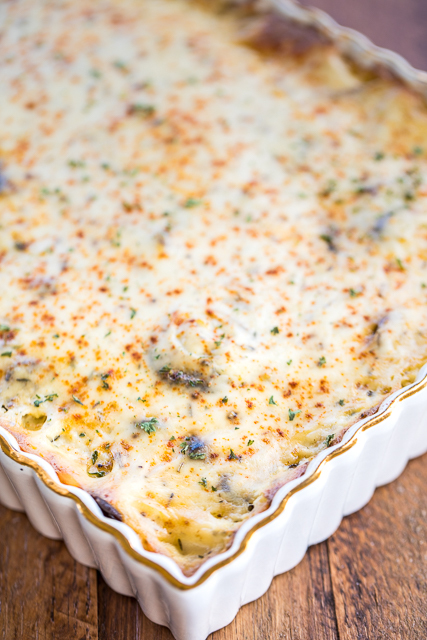 I used a mixture of white mushrooms, shiitake and baby portobello mushrooms in this casserole. To get the potato slices all the same width, I used a hand-held slicer. Make sure to use the hand guard when you are slicing the potatoes! 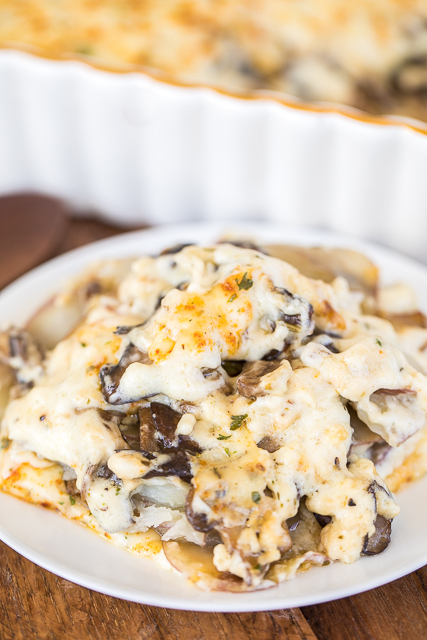 We loved these Mushroom Au Gratin Potatoes. We ate these for dinner and again for lunch the next day with our other leftovers. This casserole would be great for a party or potluck! In same pan, melt remaining 5 Tbsp butter over medium-high heat. Stir in flour until smooth. Slowly whisk in half-and-half. Bring to a boil, stirring constantly, cook until thickened, about 2 minutes. Reduce heat to low and stir in rosemary, salt and cheese. Stir until melted. Remove from heat. Arrange potatoes in an even layer in bottom of prepared pan. Top with cooked mushrooms. Pour sauce over mushrooms and sprinkle with paprika. Cover pan with aluminum foil and bake, covered, for 40 minutes. Remove foil from pan and continue baking for an additional 20 to 25 minutes.